Forget #Fedal; the biggest rivalry in tennis at the moment is #Kamoot. Diede de Groot of the Netherlands and Yui Kamiji of Japan are the No. 1 and No. 2 seeds, respectively, in this year’s women’s wheelchair singles event. 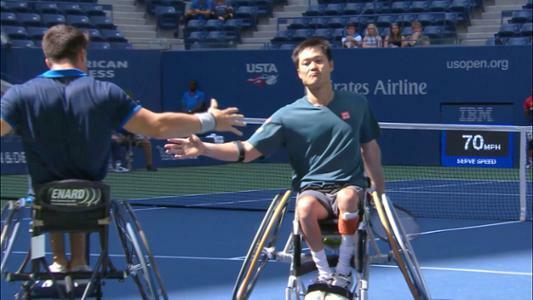 They’ve faced off eight times in the last 12 months, including three of the last four major wheelchair singles finals. Kamiji prevailed over de Groot in last year’s US Open final and again this year at Roland-Garros, while de Groot got the upper hand at the Australian Open. Kamiji leads their head-to-head count, 12-7, but de Groot has won five of their last six matches. The Dutch player also snatched the No. 1 ranking from her rival this year. September 10, 2017 - Diede de Groot in action against Yui Kamiji in the women's singles final at the 2017 US Open Wheelchair Competition. September 10, 2017 - Yui Kamiji in action against Diede de Groot in the women's singles final at the 2017 US Open Wheelchair Competition. The healthy respect de Groot and Kamiji have for each other makes their rivalry even more compelling to watch. They even teamed up to take the wheelchair doubles title this summer at Wimbledon, making de Groot the first female wheelchair player to sweep both events in the same year at the All England Club. De Groot and Kamiji have stood far beyond the rest of their peers in 2018. The Dutch player has won six singles and six doubles titles this season, in addition to leading the Netherlands to victory at the BNP Paribas World Team Cup. Kamiji has won seven singles titles and eight doubles titles this year, sitting just behind de Groot in the wheelchair tennis rankings. The Dutchwoman starts her US Open campaign on Friday against countrywoman Aniek Van Koot, and Kamiji opens up against another Dutch player, Marjolein Buis. The top two seeds will then team up in doubles against Sabine Ellerbrock and Lucy Shuker, in a rematch of this year’s Wimbledon doubles final. Should de Groot and Kamiji meet in Sunday’s final—in what would be their 20th career meeting—the opportunity to face each other again would be one they both relish. SEE ALSO: On Thursday, the world’s greatest wheelchair tennis players will take to the hard courts of Flushing Meadows to compete in the 2018 US Open Wheelchair Competition, presented by Deloitte.